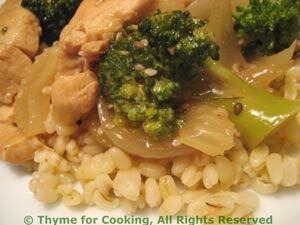 Thyme for Cooking's Main Courses: Salmon, Filet Mignon, Chicken Noodle Soup. 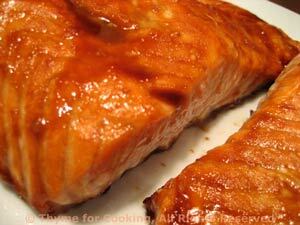 The mustard and brown sugar glaze works well with the slightly sweet flavor of salmon. Use hotter mustard if you want more of a 'kick'. 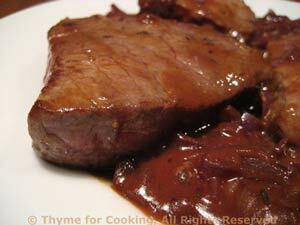 I used fillets rather than steaks: they cook in less time and the larger surface captures more of the glaze. In a small bowl, mix the sugar, mustard, soy sauce and sherry. Stir well, then let rest for 10 minutes (for sugar to dissolve). Drizzle about half of the glaze over the salmon, dividing evenly. Bake at 400F (200C) for 15 - 20 minutes, depending on thickness, but until it's opaque and flakes easily with a fork. Error on either side of perfect is okay - a little pink in the middle is better than overcooked and dry, though. After 10 minutes of baking time, remove from oven and drizzle with the remaining glaze. Continue to bake until done. Serve. If you can get cheap chicken wings, add them to the stock for more flavor. Use traditional egg noodles, spaetzle or any type of small pasta. This will make enough for 4 generous servings. 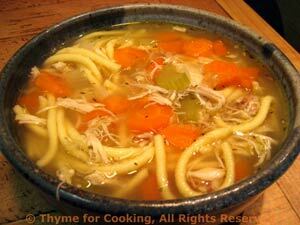 If you want more soup, use a stewing hen, or add another breast and thigh and increase the vegetables. Cover, bring to a boil, reduce heat and simmer for an hour if using breasts, 2 or 3 hours if using a whole chicken. When done, strain stock, discarding vegetables and reserving chicken. If time allows, chill stock and remove fat. Cut carrots in half, the long way then thinly slice. 1/8" (3 cm). Add to stock. Chop onion, add to stock. Add herbs, cover, reduce heat and simmer. Cut the chicken into small pieces and add to soup. The soup and vegetables should simmer for 30 minutes. Add the noodles towards the end of the cooking time and simmer until done. Taste and adjust, adding water, stock, salt or chicken base/stock cubes as needed. Serve. Pork chops, quickly seared to caramelize the surface, then braised for 15 minutes with peppers, olives and a bit of spicy tomato sauce makes an easy weeknight dinner. In medium nonstick skillet heat oil over medium-high heat. Sauté pork chops until lightly browned, about 3 minutes per side. Remove and set aside. Add chili powder, onions, garlic, pepper to pan and sauté 5 minutes. 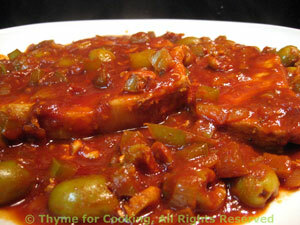 Add tomato sauce, Worcestershire sauce and olives. Reduce heat to low, cover and simmer 10 - 15 minutes, until chops are done and tender. The rice makes a lovely crust, much healthier than the traditional pastry... and easier too, especially if you cook the rice earlier. Use either brown or basmati rice. The rice: Cook the rice in stock. If doing in advance, refrigerate until needed. If doing now, spread the rice on a plate to cool for 5 minutes before making crust. The crust: Lightly whisk 1 egg. The filling: Cut ham into small strips or cubes. Thaw spinach, squeeze out all water. Heat oil in nonstick skillet and lightly sauté mushrooms, peppers. Whisk 3 eggs and milk together. To assemble: When crust is done, remove from oven. 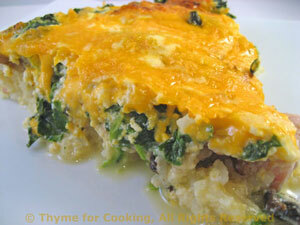 Spread the spinach evenly over the crust. Top with ricotta, mushrooms, ham and shredded cheese. Pour egg mixture over all and bake, 40 - 50 minutes, 400F (200C). When done the center should be firm or with a very slight jiggle. Toast the sesame seeds first if they are not already toasted. Add crushed red pepper flakes if you like some heat, and/or use a hotter mustard. Add celery, onion, mushrooms and stir fry 3 minutes.